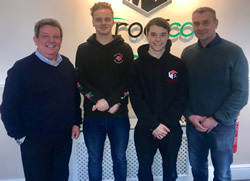 Sheffield-based Martin-Brooks is investing in the next generation of specialist roofers with the appointment of two new apprentices. William Holmes and Korneliusz Kasa are receiving hands-on training with firm’s expert teams, whilst completing an NVQ level two in slating and tiling. Martin-Brooks has recruited the duo after offering permanent positions to four former trainees, who all qualified last year. They include roofers, Alex Fearn, Jay Higgins and Adam Edwards, who studied at Leeds College of Building and joiner, Jamie Heritage. William and Korneliusz have embarked on a two-year course with Sheffield College and will spend one day a week in the classroom, qualifying in January 2020. The remainder of their week is spent learning their trade on site with Martin-Brooks’ experienced roofers, working on a wide range of projects, from small domestic repairs to reroofing listed buildings.